As most of you are now probably aware, there is a new prompt when anyone force publishes content. This feature (which went live as last week's newsletter went out) means that anyone who has to force publish an item can explain why that's the case. This comment is then added to the 'Notes' tab. It should be a useful audit tool and help writers and editors keep track of any work that hasn't had the 2i treatment. 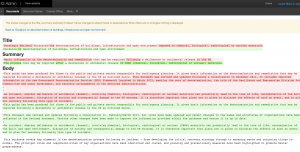 Another new feature allows you to compare the latest version of a document. The screenshot below shows how changes are highlighted if you click on 'Compare with previous version' in the 'History' tab of a document (with red showing the previous version and green the newly edited version of the text). So, you could pick up from the force publish note that something has been published with no 2i done, then check what the changes were by comparing versions. Please let us know how you get on with this - and with any of the other changes mentioned here. A further development might be to allow a choice of markup? With increasing quantities of legal guidance coming across to IG with the ALB transition it would be very useful to have the legal 'redline' style. The existing view is similar to a computing diff, whereas legal writers generally use a 'redline' form of document comparison (http://en.wikipedia.org/wiki/Document_comparison) where deleted words are crossed out and new words are underlined. This has the advantage that it is familiar and easy to read for anyone from a legal background, it is easier to read for the ~10% of men who are red-green colour blind, and it is possible to print in black and white for readers who want to proof read on paper. I agree with Stephen - the addition of a strike-through style to deleted words would make it clearer. 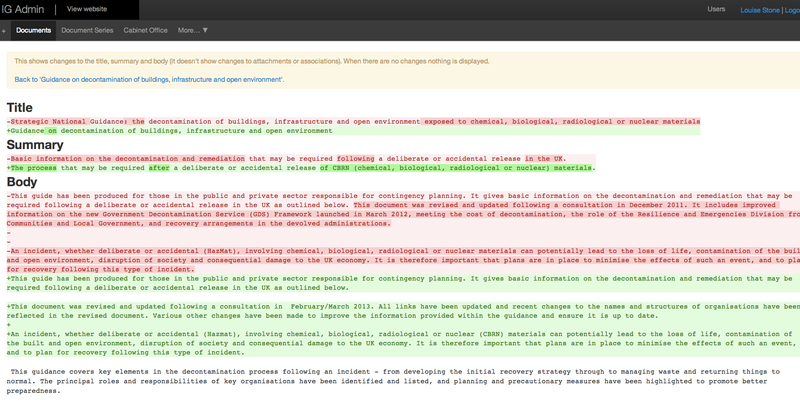 In the CMS which we developed, we use an OpenSource Diff engine to identify the differences, we then use strike-through and red colour style for deletions and green words for additions (although no underline for additions as Stephen suggests, which would be even clearer! ).